The setting sun had cast a pinkish glow on the storm clouds brewing along the horizon near Cedar Key, Florida. My friends and I bobbed in the shallow water of a low tide, relaxing on the boat in the warm summer air. My friends Savanna and Travis have lived in Cedar Key for over a year now, and since they know how much I love birds they knew where they had to take me during my visit: Snake Key, part of the Cedar Key National Wildlife Refuge. 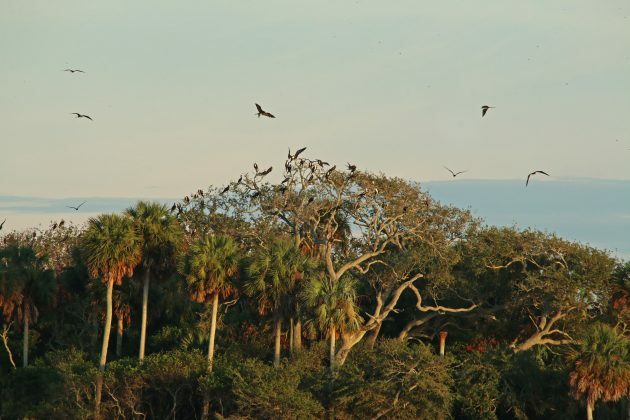 Birds swirled over the treetops, from the giant Magnificent Frigatebirds to the comparatively diminutive Purple Martins. Exposed mudflats were a magnet for wading birds: I have never seen so many Black-crowned Night Herons in my life! Tricolored Herons and Great Blue Herons and Roseate Spoonbills and Great Egrets and White Ibises – I honestly didn’t know where to look first. And more were coming! Flocks and individual birds soared in, dark silhouettes against the still-bright sky. They foraged on the mainland in freshwater during the day, returning to the colony as the stars began to flutter to life. Why? It’s simple: the babies. Parent birds must fly thirty plus miles up the Suwannee or to alternative freshwater sources to gather food for their young that is not salty, in order not to dehydrate the young. ~ Cedar Key National Wildlife Refuge. 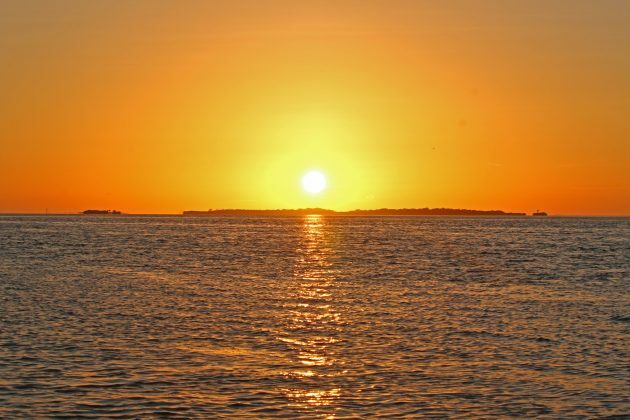 Established in 1929, Cedar Key National Wildlife Refuge is made up of 13 islands, including Snake Key. 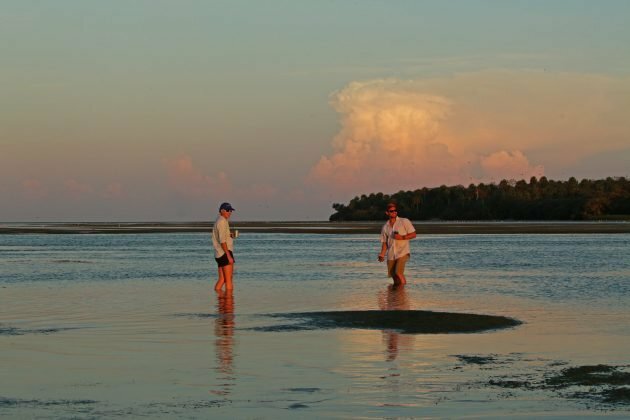 Some were created from the waters of the Gulf of Mexico by Native American fish camps, when people discarded oyster and other shells into giant shell middens jutting far enough above the water that vegetation could begin to take hold. Once, 200,000 birds nested on these islands – today the population is closer to 20,000. Friends walking around at low tide. There are a lot of positive aspects to birding: it’s fun, it can inspire exercise, it’s an outdoor activity away from addictive screens, etc. But one of the most important to me is the awe birding can inspire. We had one pair of binoculars on the boat for five people, and we passed them around the circle like a hot potato because we just could not get enough of the birds that literally surrounded us. In fact, we stayed so long we almost got stuck as the tide continued to go out! 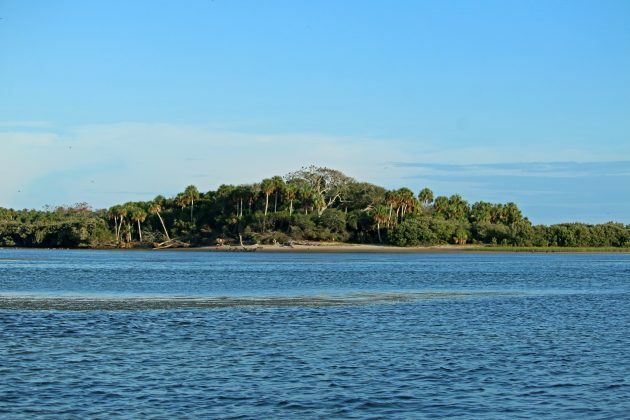 I know I’ll be back to Cedar Key, and one of my new goals is to bird all 13 islands in the refuge. Erika Zambello is a National Geographic Young Explorer who grew up in Maine, inspiring a deep interest in nature at an early age. She fell in love with birding after receiving a Sibley field guide for Christmas during her senior year in college, and has birded across the eastern seaboard and internationally ever since. To inspire others to protect birds and the environment, she has blogged for the Conservation Fund, Sarah P. Duke Gardens, Triangle Land Conservancy, and Duke University, and is writing a birding guide to Northern New England for Wilderness Adventures Press. She has founded OneWorldTwoFeet.com, and is currently living along the Emerald Coast in Florida's Panhandle. You can check out her exploration site or follow her on Instragram.